Welcome to my Old Spice Collectible web site. I started this site to provide a resource to collectors of Old Spice for Men toiletries. The contents of this site reflect my own research based on sales catalogs from 1938 to about 1992 as well as contributions from many collectors willing to share new items and information. Old Spice is a registered trademark of Procter and Gamble. Please note that I am not affiliated with Old Spice or Procter & Gamble, and I am not interested in buying items or selling stuff from my collection. If you are unhappy with some aspect of Old Spice products, I do not care and ask that you contact P&G directly. The scope of information here is limited to Old Spice for Men toiletries between 1938 and the early 1990s, produced mainly to the US market (though you will find information here and there on products made for Great Britain and Canada). Procter and Gamble bought the brand in 1990 and unfortunately they have been unwilling to share any product information with me. Therefore I am unable to provide much clarity for anything much after the early 1990s. The Shulton Company is best known for its line of Men's fragrances and toiletries, but Shulton began in 1934 as a manufacturer of soaps and women's fragrances, among them Early American Old Spice (the use of the term "...for Men" started with the introduction of the men's products in 1938), Friendship Garden and Desert Flower. By the time of its sale to American Cyanamid in the 1970 it was a diversified world-wide company making men's and women's toiletries, beauty products and a wide range of household products and industrial chemicals. The navigation buttons on the left of each page should help you get around and find what you are looking for. What's inside?? MUGS will help you identify and date shaving mugs and a few coffee mugs. BOTTLES will help you identify virtually any container that holds after shave, cologne or talcum powder. TOILETRIES will introduce to many other toiletries for men such lotions, hair products and soaps. SHAVING PRODUCTS describes the shaving creams, brushes razors and other shaving accessories branded by Old Spice over the years. ADVERTISING lets you view a large number of magazine ads sorted by decade and other ephemera used to promote Old Spice products. PACKAGING discusses the innovative ways in which Shulton used packaging to achieve market dominance in men's toiletries for many years. 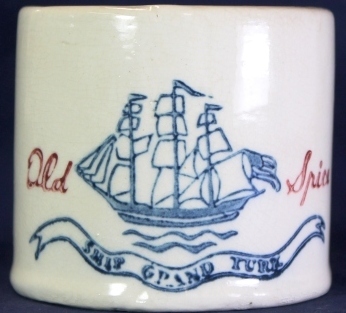 More Shulton Info will answer some common questions, provide a complete product listing, describe the many "Old Spice" ships and provide some resource material on the history of Shulton and Old Spice.